Was very happy to be in Terminal 2 so close. Hotel is easy to get in an out and fast. i was stay only one night at ohare inn and suite as i wait for my flight. room was nice clean and comfortable. they have free shuttle service to airport. One of the best hotel I have ever stayed for a transit in terms of value for money. The hotel is a bit far from the airport. I kept waiting longer, although it says the shuttle operates every 30min. Nevertheless, the hotel has advantages in a variety of room rates whose conditions are flexibly set, and in reliable room and service quality offered under the Best Western brand. I will use this hotel again if I should have an overnight stay at Chicago Airport. I love this brand, always stay at doubletree, enjoy the cookie ! I have almost no complaints... The shuttle bus and drivers were the best thing about the hotel. Try to book a room facing west as the east side room are right next to. The tollway and very noisy. Good shuttle and airport transfer every 15 or so minutes. Food was decent at the built in hotel. Didn't use anything else, friendly staff. Very very fast check in and check out. Breakfast is great with great service. Close to airport, friendly accommodating Staff. Quiet. Large suites. Nice facilities. Cons- food pricy for the quality. O`Hare International Airport is one of Chicago (IL)'s most visited destinations. There are many attractions to discover in this part of town such as Brookstone, Chicago O'Hare International Airport, NS Macaron. An undeniably popular travel destination, O`Hare International Airport offers a memorable escape with its famous sites and fine dining. Finding a great deal is made easy with Agoda.com, offering cheap hotels in O`Hare International Airport or any other area in Chicago (IL). 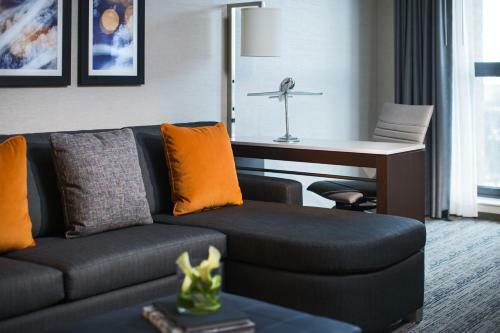 Station yourself in the cozy Hampton Inn Chicago-O'Hare Intl Airport or the stunning Embassy Suites Chicago O'Hare Rosemont Hotel when you plan your next trip here. Fill in your dates of stay and browse through the top hotel deals in O`Hare International Airport.